The Rear End Cap is designed to mimic the outside of the Rear Bag. It is used to finish the exposed rear area of a bag, center section, or end cap by zipping on to the exposed area. By adding a Rear End Cap, not only do you add functionality, you protect the exposed zipper, preventing possible damage. The Rear End Cap is 13.5" x 10.5". 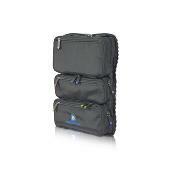 NOTE: The FLEX modules WILL NOT WORK with (will not zip onto) any older BrightLine Bag. The zippers had to be of a different type to allow this modularity concept to work. 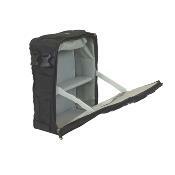 The Rear End Cap can attach to the rear end of all FLEX System modules except the Rear Bag. The Rear End Cap does not come with a Main Handle or a Shoulder Strap. There are three pockets on the outer surface of the Rear End Cap. One main flat pocket that covers the full width and height of the rear panel that is great for storing your iPad or other tablet computer, a thin stack of documents or a magazine or two. 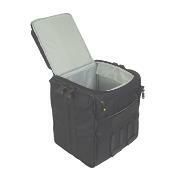 The primary pocket is accessed from the top and has a cover flap that is secured with Velcro. There is a second flat pocket on the outside of the first one that is somewhat smaller that is accessed through a vertical zipper on the rear panel. 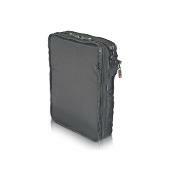 This is a great place to store a few smaller documents such as some travel documents or receipts etc. 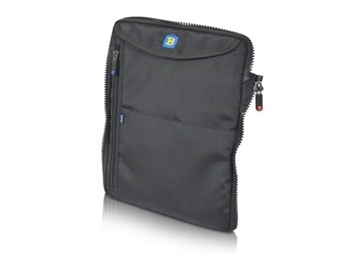 And finally there is a third flat half pipe slip pocket that acts as a great place to store a couple of basic documents that you want to have easy access to such as today's checklists or your boarding pass etc. The Rear End Cap is not intended to be carried by itself without anything zipped onto its front surface. The front exterior surface of the Rear End is just a "naked" panel with no pockets. With nothing attached to this surface, the separation zipper (the main zipper that allows other FLEX modules to be zipped on) ends up being rather exposed because it is just "hanging off" the front side of the bag. (Plus it just plain looks bad.) If you plan to carry the Rear End Cap by itself you should make sure you have a Front End Cap available as part of your FLEX system. This will do several things all at once:  It will "complete" the front surface of the Rear End Cap making it look finished and professional. It will protect the separation zipper by closing it off. You will get our smallest configuration. We call this the Portfolio Bag. 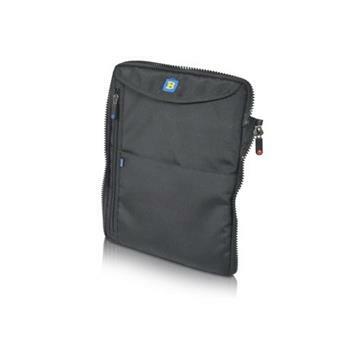 Perfect for your iPad or tablet computer and its cords, drives, and documents you need to carry. This configuration comes with a Portfolio Handle, which attaches to the Front End Cap.